**Following the critical and commercial success of Absolutely Foxed, Graeme Fowler returns with a stunning new book that takes the reader inside the mental side of cricket. ** Few sports can be played as much in the mind as cricket. When bowlers are hurling the ball down at your head at 90 mph, or fielders are crowded round the bat waiting to snap up an edge, only the most resilient can thrive. 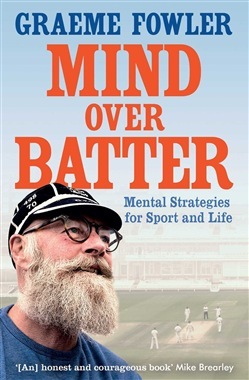 In Mind Over Batter, former Test batsman, commentator and coach Fowler looks into all facets of the game to assess the mental aspect of cricket. What is mental strength? And how can you improve it, or why do some people suddenly lose it? Can the environment in a dressing room have any impact on both mental strength and mental health? When a game builds up to a dramatic climax - how do you train yourself to cope? Can pressure really lead to catastrophic decision-making and even lead players to bend the rules? Told with his familiar mix of brilliant insight, hilarious anecdotes and moving personal experience of his own mental demons, Fowler delivers a superb portrait of the game. Mind Over Batter will not only shed light on the top echelons of cricket, but it will also provide the reader with many useful ideas on how they can improve their own game and performance - in cricket or in other walks of life. Finally, having resisted for many years despite his own mental health issues, Fowler decides to take a closer look inside his own mind and for the first time undergoes therapy to see if he can work out what makes him tick. What he discovered surprised even him. Acquista Mind Over Batter in Epub: dopo aver letto l’ebook Mind Over Batter di Graeme Fowler ti invitiamo a lasciarci una Recensione qui sotto: sarà utile agli utenti che non abbiano ancora letto questo libro e che vogliano avere delle opinioni altrui. L’opinione su di un libro è molto soggettiva e per questo leggere eventuali recensioni negative non ci dovrà frenare dall’acquisto, anzi dovrà spingerci ad acquistare il libro in fretta per poter dire la nostra ed eventualmente smentire quanto commentato da altri, contribuendo ad arricchire più possibile i commenti e dare sempre più spunti di confronto al pubblico online.